Emerald & Diamond from the Livia collection made in our workshop in County Wicklow Ireland.In 18..
A beautiful Irish made Ring featuring Celtic Knots made in 10 Karat Gold highlighted by a 0.50 Carat..
A Celtic Knot Ring with Diamond made in 14 Karat Gold, also features a 0.50 Carat Diamond. Width is ..
A beautiful Irish made Ring featuring Celtic Knots made in 10 Karat Gold - the centrepiece is a 0.10..
A beautiful Claddagh Ring made from 14 Karat Gold - a brilliant 0.25 Carat Diamond is set into the H.. 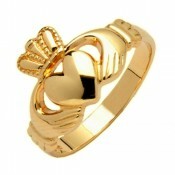 This is a beautiful Claddagh Ring made from 14 Karat Gold, a beautiful .05ct diamond set into the he..
A Beautiful Gold Two Tone Diamond Ring wiith a 0.50ct Diamond. Ring width is 6mm.The ring is from th..
Another Celtic Trinity Knot Ring from our comprehensive range.The Trinity is made from White Gold pl..
An Irish Gold and Diamond Ring with Celtic Knots made in our Wicklow studio. 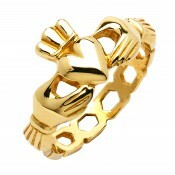 It is made in 14 Karat ..
Another Irish Gold Ring from our comprehensive range - we call this the Warrior Shield! - ..
Another Celtic Knot Ring from our comprehensive range - we call this the Warrior Shield!- ..
Another fabulous Irish Made Wedding Ring made in 10 Karat Gold from the "Livia" range of jewellery -..
Another Irish Ring from our comprehensive range. The Livia Collection honours the River Liffey which..
Another Wedding Ring made in 10Karat Gold, it is from our "Livia" range of jewellery - Livia was an ..
Another fabulous Irish Made Wedding Ring made in 14 Karat Gold from the "Livia" range of jewellery..
Another Irish Wedding Ring made in 14 Karat Gold from the "Livia" range of jewellery - Livia was an ..
Another Wedding Ring made in 18 Karat Gold, it is from our "Livia" range of jewellery - Livia was an..
A beautiful Wedding Ring made in 18 Karat Gold, it is from our "Livia" range of jewellery - Livia wa..
A great Wedding Ring made in 18 Karat Gold from the "Livia" range of jewellery - Livia was an ancien..
A beautiful Claddagh Band Ring made from Yellow Gold here in our Wicklow Workshop - it has the class..
A lovely Wedding Ring made in Sterling Silver Centre with edges made from 14 Karat Gold, it is..
A beautiful Claddagh Band Ring made from Sterling Silver. 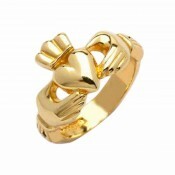 It has the classic features of Heart, Hand..
An Irish Silver Wedding Ring from our Livia Range of Jewelry. Livia is an ancient name for the River..
A beautiful Wedding Band Ring made from Sterling Silver. 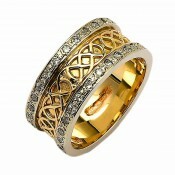 It comes from our Livia Range of Jewelry - ..
An Irish Silver Wedding Ring from our Livia Range of Jewelry. Livia is an ancient name for the Riv..
A lovely Wedding Ring made from White 14 Karat Gold in the centre and 14 Karat Yellow Gold on ..
A lovely Wedding Ring made from White 18 Karat Gold in the centre and 18 Karat Yellow Gold o..
Another Celtic Knot Ring from our comprehensive range - we call this the Warrior Shield! Yellow Gold..
Another Celtic Knot Ring from our comprehensive range - we call this the Warrior Shield!Yellow Gold ..
A lovely Wedding Ring made from Yellow 14 Karat Gold in the centre and 14 Karat White Gold o..
A heavy Wedding Ring made from Yellow 14 Karat Gold in the centre and 14 Karat White Gold on the edg..
A Narrow Wedding Ring made from a White Gold Centre and Yellow Gold Edge - it is from our "Sheelin" ..
A Wide Wedding Ring made from a White Gold Centre and Yellow Gold Edge - it is from our "Sheelin" ..
A Wide Pierced Wedding Ring made from White 14 Karat Gold in the centre and 14 Karat Yellow Gold o..
Irish Celtic Rings - Celtic Knots, Swirls, Claddagh Bands and rings. We are really proud of the design and quality of the rings we produce here in Wicklow and look forward to sharing them with you!